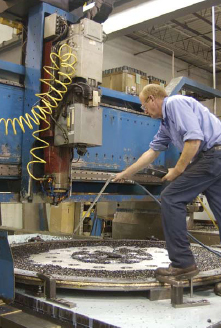 Milling slots in a hollow cylindrical workpiece on the larger Quickmill gantry-type machining center at Gilchrist Metal Fabricating Company. The machining center’s gantry towers over the machinist, and the machinist has to climb on the machine’s table to measure a slot cut in the 20 foot-long part. Way up near the ceiling a bright yellow beam announces that the attached hoist has a capacity of 15 tons. Welcome to the world of big machines and big parts. You may be accustomed to making thousands of parts a day and shipping them out in boxes. What’s it like to make the big stuff? What’s different about machining large parts? Making chips isn’t that much different on large parts. It’s still about feeds and speeds. But factors such as part handling, setup and thermal expansion can complicate what happens before and after making those chips. Setup of a large part can be a painstaking process, bordering on an art form. First of all, you need to use a fork truck, crane or hoist to move the workpiece. You’ll seldom work from solid material and will most likely start with a weldment or a casting — so the raw parts probably won’t be as square and straight as you would like. You’ll need to align the workpiece to allow for any twist, bow or sag, and support it so it stays rigid under the tools. Not only does the part have to be properly aligned on the machine, you have to make sure it is supported suffi ciently. Even if you have a plate 10 feet in diameter and eight inches thick that weighs 12 tons, Buchholz said, everything fl exes, and the setup has to give the part rigidity while it is being machined. 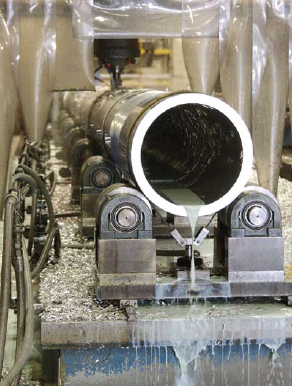 The hold-down system allows rotation of this hollow cylindrical workpiece at Gilchrist Metal Fabricating Company. before they are machined, large ones are likely to spring and twist as you remove material, said Bob Price, regional sales manager at SNK America, Inc. in Elk Grove, Ill. After taking the rough cut, let the workpiece loose and reset it, he said. Then, take another cut before the finish cut, for three passes: rough, semi and finish. Another factor small-parts shops are not accustomed to worrying about is thermal expansion. “Temperature can make a make a huge difference on a 3, 4 or 5-meter part,” said Price, you have to let the part reach room temperature before setting up the job and starting to machine. You can calculate the effect of thermal expansion. For example, a change in temperature of 20 F could change the length of a 10-foot (3-meter) steel part by about an eighth of an inch. Because of these factors and the variety of work, you will seldom make more than a couple of the same large parts. Machine operators and programmers need a high level of skill and experience. Measuring large and irregularly shaped parts can present quite a challenge, too. “A lot of inspection is done on the machine,” said Price. There, you can use a probe in the spindle to locate surfaces and features. For off-machine inspection, large coordinate measuring machines (CMMs) are available, and the latest types of laser systems can take care of measuring very large parts to high precision. A wide variety of industries need large machined parts, for example: semiconductor manufacturing, wind power, construction and agricultural equipment, machine tools, aerospace, stamping dies, plastic molds, power generation, food processing, paper manufacturing, oil drilling and chemical processing. What is the price for large parts? There is a big range, of course, Buchholz said, but Quickmill customers might be looking at making parts in the $10,000 to $50,000 range. Being competitive in the large parts market depends on factors such as machine capacity and proximity to customers. Not every shop has the machines to produce parts that are meters long and weigh tons. And very large parts are so expensive to ship, that a local shop can have a defi nite competitive edge when quoting parts, Buchholz said. Shipping very large parts to a relatively nearby customer might cost $3000 to $5000, he estimated, while shipping the same part 500 or 1000 miles might be $25,000 to $30,000. These are parts that need a boom crane to load them on a special trailer and then require oversize permits so they can be transported over the road. Gilchrist Metal Fabricating in Hudson, N.H., has made a significant investment in machining equipment for large parts, said Jack Gilchrist, company president. Several machining centers from Mori Seiki and other manufacturers, and a large Toshiba horizontal boring/milling machine make completely machined parts or put the fi nishing touches on weldments. “The ‘chip equipment’ was purchased to support the fab,” said Gilchrist. “We’re a medium-gauge fabrication house. The parts can mostly be loaded with a fork truck. No [parts for] tanks or trucks — or computer chassis, either,” he said. The company works mostly with 1/16” to 2” thick stock. We combine fabrication and machining, which is not usually done. Machinist Dana Hamlin clears chips from the large disk he is machining on a Quickmill gantry-type machining center at Gilchrist Metal Fabricating Company. In a separate building, two Quickmill gantry-style machining centers were hard at work on a recent Tuesday morning. 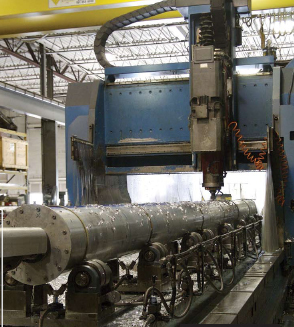 One had a 5-by-27-foot bed and was machining slots into a long aluminum pipe. The other had an 8-foot diameter disk mounted on its 8-by-15-foot bed and was drilling, milling and chamfering a lot of holes in it. 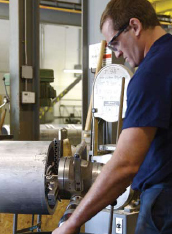 Machinist Austin Hamlin was cutting a series of lengthwise slots in the pipe on the larger Quickmill. The pipe, perhaps 20 feet long and a foot in diameter, was mounted on a series of rollers and held down with strapping secured by hydraulic jacks. The end nearest the machine console was attached to a pipe rotation device, turned by hand and equipped with an encoder, which fed the change in angle to the control. When a row of slots was finished, the jacks were released and the pipe rotated to the position for the next row. In order to check the dimensions of one of the slots, Hamlin had to climb up on the bed of the machine. The shop has been working on a series of similar workpieces made from lengths of aluminum or steel pipe, in sizes up to 75 feet long, the heaviest weighing over 10 tons. For a part longer than the machine bed, 25 feet of the piece are machined, then it is moved, probed and properly aligned, and the next 25 feet are machined. Each of these pipe-based workpieces has dozens of slots cut into it and hundreds of tapped quarter-inch holes. Most of the holes are drilled and tapped on the machining center. Welder/fabricator Wayne Bryant uses a portable lathe to fi nish the end of a segment of pipe at Gilchrist Metal Fabricating Company. Machinist, Dana Hamlin, Austin’s father, was operating the other Quickmill. The disk he was machining, he said, was a combination of a mild steel base about an inch thick, with a layer of stainless steel bonded to it. The stainless steel was on top as he machined the part, and he was using feeds and speeds appropriate for the stainless steel. The two materials had been bonded together by a process called explosive bonding, he explained. The company that bonded the part places a sheet of stainless steel on top of a thicker sheet of mild steel, and applies a layer of explosive. Then the assemblage is buried in the ground and the explosive is detonated. The shock wave from the explosion forces the top layer into contact with the base layer at such high pressure that the two materials form an inseparable bond. The disk will be a “tube sheet” for a boiler or similar application. Tubes will be welded into the dozens of holes he was machining. Not far from the very large machines was a very small machine. Welder/fabricator Wayne Bryant was using a portable lathe to finish the ends of a segment of aluminum pipe. This is much simpler than mounting the part on a conventional lathe, Gilchrist said. The portable lathe clamps inside the pipe and then rotates a cutting tool along the end of the pipe. This was a new tool for the shop and provided a simple, effective, inexpensive way to get the job done. Working big means expensive equipment, handling and setup challenges, and even shipping subtleties. It also means a shop may be able to distinguish itself from competitors and branch out into whole new markets. The cost of entry into the world of big can be signifi cant, but enterprising shops are finding that the return on that investment can make the effort worthwhile.